Yesterday was a good day. We went for tailgating and drank a lot of bud light in the bright afternoon sun. Cal football won a beautiful game against Utah, we took a nap and then we met a few friends for drinks/eats for their engagement party. We drank champagne and large punch bowls of far too sweet liquor and fell into bed exhausted at 1am. It was a good day. Needless to say, this morning was not the best day. I wasn't feeling terrible, but I wasn't feeling my best. I was certainly not up for yoga this morning. I only wanted miso soup or ochazuke, which is what I normally have on mornings like this. Unfortunately, I am out of both rice and miso paste (today is grocery shopping day) so I decided to experiment. I've never been a fan of savory oatmeal, but this may change my mind. It is perfectly savory and without too much liquid, the oats are more like a great grain than a porridge. I think that's why I never liked savory oatmeal before... I always added too much liquid. These oats were cooked with chicken stock and dashi though they could very easily be made vegetarian with veg stock and a mushroom dashi. . 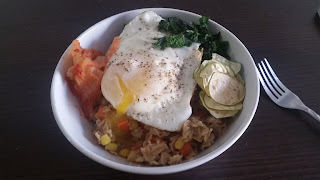 They tasted a little like ramen, but was still a delightful breakfast that's hearty and full of fiber. Highly recommended the next time you want something different for breakfast. Spoon into a bowl. 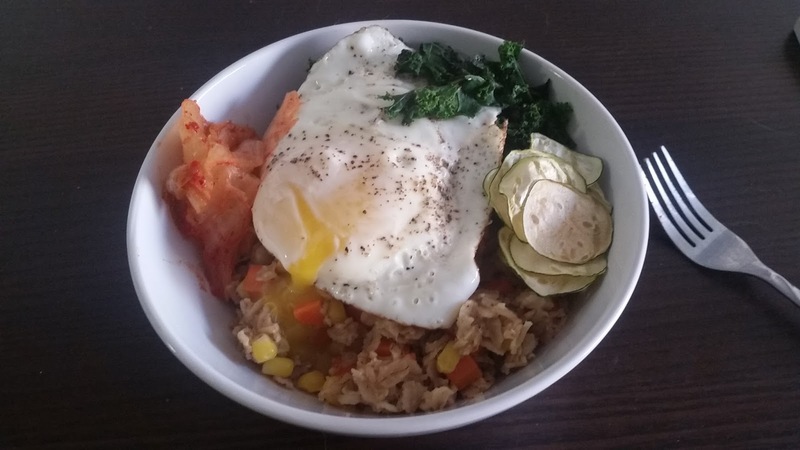 Top with sauteed kale, fried egg, kimchi and whatever else sounds good.